It’s true – our cutlery is always a “cut” above the rest! At Woodland Creek, we know you’re passionate about everything from fine cottage furniture to rustic country décor and more. And you deserve the best. That’s why our cutlery and other dining room accessories are a “cut” above the rest. 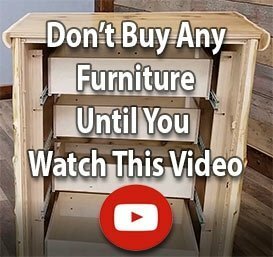 In fact, there may be nothing we love more than sharing unique finds in rustic décor with those of you who cherish rustic decorating as much as we do. You’ve got style and it’s high time you showed it off! Your great taste in rustic furniture is just the tip of the iceberg (lettuce, we mean). Imagine sitting around your fine rustic log furniture dining table digging into a sumptuous meal. A meal you prepared from scratch, mind you! Make the most of that experience with friends and family by accessorizing your table in high style. Sink your teeth into some truly unusual ways to display your love of cabin and lodge décor! Sure, we could offer you some run-of-the-mill options in cutlery and accessories. But, what would be the point? At Woodland Creek, we want to give you something you can truly sink your teeth into. After all, who needs the humdrum when you can outfit your dining room in cabin décor inspired accents that complete – vs. compete with – your fine rustic wood furniture look?